Byron Crouse, MD, a professor in the DFMCH and the SMPH’s associate dean for rural and community health, retired in May. He led multiple programs focused on educating physicians to serve rural areas of Wisconsin and the nation. The University of Wisconsin Department of Family Medicine and Community Health (DFMCH) honors Byron Crouse, MD, who retired in May. 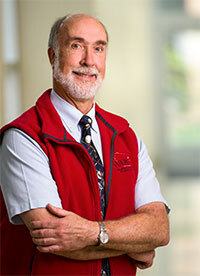 Throughout his 17-year career at the University of Wisconsin School of Medicine and Public Health (SMPH)—most recently as the associate dean for rural and community health—Crouse has kept a steady focus on developing the vision and skills of future physicians to serve rural areas of the state and nation. Well known for his compassion, humility and collaborative spirit, Crouse has accomplished this through one-on-one student mentoring, but more importantly, through his leadership of programs that span the continuum of medical education—and reach every corner of the state. Having earned his medical degree from Mayo Medical School in Rochester, Minnesota, Crouse completed a residency at the Duluth Family Practice Residency Program and practiced medicine for six years. He joined academic medicine in 1986, when he became the assistant director of the Family Medicine Residency Program at the University of Minnesota Medical School, Duluth. In 1994, he became the first head of that school’s Department of Family Medicine. And two years later, he led the development of the interdisciplinary Minnesota Rural Health School, which linked three University of Minnesota colleges and two private colleges that were involved in educating health care professionals. Crouse piloted the SMPH’s Longitudinal Rural Rotation, an integrated 20-week experience that combined three existing requirements: the third-year Primary Care Clerkship, fourth-year Preceptorship Program and fourth-year Surgery Clerkship. Students completed the rotation in one of four rural Wisconsin communities— Rice Lake, Mauston, Black River Falls or Prairie du Chien—so their clinical experiences closely mirrored rural practice. The success of the rural rotation and the release of the 2004 Wisconsin physician workforce report, “Who Will Care for Our Patients?” paved the way for a formal rural medical education pipeline program at the SMPH. Thanks to startup funds from the Wisconsin Partnership Program and support from former and current SMPH Deans Philip Farrell, MD, PhD (PG ’72), and Golden, respectively, the Wisconsin Academy for Rural Medicine (WARM) launched in 2007 with Crouse as its director from the beginning through his spring 2018 retirement. Functioning as a “school within a school,” WARM seeks students who have a strong desire to practice rural medicine in Wisconsin, a rural background or connections, and a strong record of community involvement. It provides trainees with a rural-focused curriculum and required clerkships at rural sites throughout the state. Studies show that these factors, in addition to a future residency at a rural medical center, are the biggest predictors of the ability to recruit and retain physicians in rural areas. “I first met Byron Crouse at the WARM Symposium before I was in medical school, and found his passion and calm demeanor comforting; he helped convince me to apply as a WARM student,” recalls Mathew Herbst, MD ’15 (PG ’18), who completed a family medicine residency in the DFMCH’s Baraboo Rural Training Track. WARM has grown from admitting five students per year to 26 per year, and it has graduated 154 students. Of the 55 graduates who are now practicing medicine, 89 percent (49) are doing so in Wisconsin, 47 percent (26) in rural Wisconsin, and 35 percent (19) in their hometowns. “It really helps students to have someone within the school who can talk about wanting to be a rural physician,” notes Crouse, who proudly shared his practice experiences while mentoring WARM students. For H. Clay Dean, MD ’11, one of WARM’s first graduates, who now practices general surgery at Sauk Prairie Healthcare in Prairie du Sac, Wisconsin, the program offered valuable skills and helped him see that rural physicians are not just doctors, but leaders. Crouse’s work also addressed another important factor about rural health care— that physicians’ residency locations can play a key role in where they choose to work. One study found that 76 percent of graduates of a rural track residency program entered rural practice. Crouse and other school leaders recognized that Wisconsin needed more rural residency positions to retain graduates. Through their collaborative efforts, in 2010, the Wisconsin legislature provided funding for the Wisconsin Rural Physician Residency Assistance Program (WRPRAP), which distributes grants to rural hospitals and educational institutions statewide to help them develop rural residency programs, tracks and rotations. Administered by the DFMCH, WRPRAP was first led by William Schwab, MD, DFMCH vice chair for education, and then—starting in 2011—by Crouse. (Dr. Schwab became WRPRAP director this May after Dr. Crouse’s retirement [see sidebar]). “WRPRAP is not just the DFMCH, the SMPH or UW-Madison. We’re working with partners and health care systems across the state,” Crouse notes. To date, WRPRAP has awarded 74 grants to support the development of rural residency programs, rural tracks within urban residency programs, and other graduate medical education (GME) opportunities for rural residency programs, hospitals and clinics. In collaboration with the Wisconsin Department of Health Services’ GME Initiative, since 2010, WRPRAP grants have helped establish 36 new first-year rural resident and fellowship positions across six specialties—family medicine, general surgery, internal medicine, obstetrics and gynecology, pediatrics and psychiatry—that are critically needed in rural communities. Program leaders project that by 2020, Wisconsin will have 208 residents and fellows participating in rural programs, compared to 67 in 2010. In recognition of his accomplishments, Crouse has been invited to serve in many local, state and national leadership roles, including co-chair of the Rural Medical Educators group of the National Rural Health Association. Among his many honors, in 2018 Crouse was inducted into Alpha Omega Alpha and earned the Albert Nelson Marquis Lifetime Achievement Award, Marquis Who’s Who. He also received the American Academy of Family Physicians Thomas W. Johnson Award; Wisconsin Academy of Family Physicians Educator of the Year Award; National Rural Health Association Distinguished Educator Award; and Society of Teachers of Family Medicine Bishop Fellowship. Crouse is proud to have brought together statewide partners to help strengthen the rural physician pipeline—from medical school admission to rural residency capacity building—which represents work that “exemplifies the Wisconsin Idea,” he says. “The past 17 years at the SMPH have been exciting and rewarding. When I started, I was charged with developing programs to address health care disparities in rural Wisconsin. I found that there were already several rural initiatives at the SMPH, but they were like a jigsaw puzzle that had been scattered around,” Crouse reflects. As Crouse retires and returns to live north of Rice Lake, Wisconsin—25 miles from where he first practiced medicine— he plans to remain engaged in community opportunities, including volunteering for community medical education projects and “hammering some nails” for Habitat for Humanity. “I will miss many colleagues, friends and students as I leave Madison. However, I look forward to living full-time in the Rice Lake/ Spooner area and enjoying the wonders of northern Wisconsin,” he reflects, adding that he and his wife, Pam Crouse, also will spend time with their two grown children and their families. Crouse’s efforts have left an indelible mark on Wisconsin’s current and future rural physicians and communities. Dean agrees with Herbst and others. UW DFMCH Vice Chair for Education William Schwab, MD, is the director of the Wisconsin Rural Physician Residency Assistance Program (WRPRAP), effective May 21, 2018. He steps in as director after the retirement of Byron Crouse, MD, the SMPH associate dean for rural and community health who had led WRPRAP since 2011. 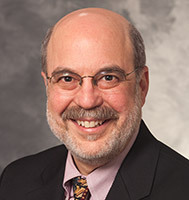 Dr. Schwab has had a long-time connection with WRPRAP, having been the program’s first director when it was established in 2010 through the passage of Wisconsin Act 190. WRPRAP promotes collaboration among Wisconsin health systems, residency and fellowship programs and state agencies that aim to enhance rural graduate medical education (GME). Its funding opportunities target and prioritize educational activities for new physicians in rural Wisconsin communities, with the goal of training more physicians to meet Wisconsin’s rural workforce needs. The program, which is administratively housed in the DFMCH, has been renewed each biennium since originally enacted.